Location: Across the bay from Homer on the eastern shore of Cook Inlet. Off the road system, so access is by air, Alaska Marine Highway ferry and boat; daily flights and ferries available from Homer. Population: 266. 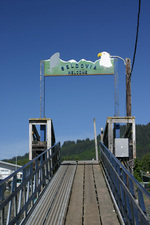 Visitor Information: www.seldovia.com. Seldovia is one of Alaska’s most beautiful and best-kept secrets, situated on a triangular land base formed by beautiful Kachemak Bay, Seldovia Bay and picturesque Seldovia Slough. Surrounded by gorgeous shorelines and mountains, this secluded city is accessible only by air or sea, making for a timeless, unhurried and friendly atmosphere. Because it is removed from Kenai Peninsula highways, Seldovia has retained much of its old Alaska charm and traditions. 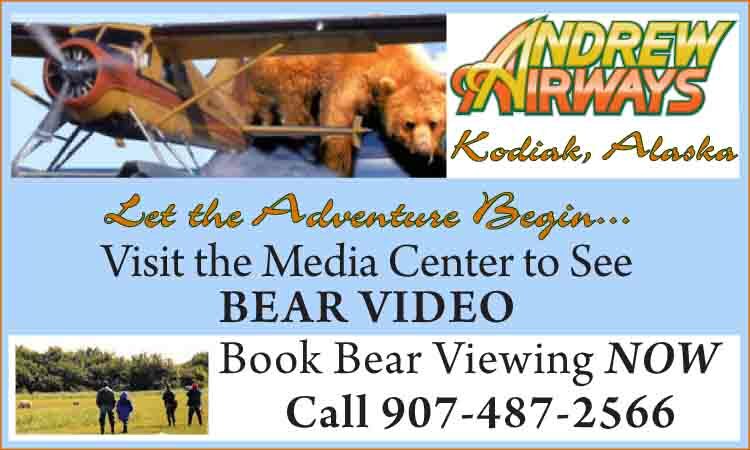 Visitors searching for quiet, small town tranquility and calm lifestyle can now fly with ease on a direct flight to Seldovia three days a week from Anchorage, along with hourly flights from Homer every day. If you want to come across by water from Homer, you can take the Alaska Marine Highway or one of a few passenger ferries/tour boats or even a water taxi to Jakolof Bay. While Athabascan, Aleut and Eskimo peoples made camp at the mouth of the Seldovia River for hundreds of years, the area’s modern history began in 1786 when coal was discovered by Russians at Port Graham between Seldovia and English Bay, with 2,700 tons of coal subsequently mined. Local natives were hired to work the mines alongside imported Russian convicts. 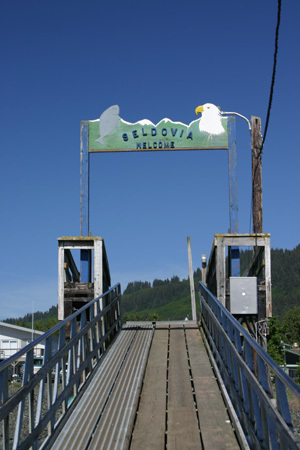 Seldovia was originally named by Russian Captain Archimandritov in the mid-1800s “Zaliv Seldevoy,” meaning “Herring Bay” after the abundant fish. Russian and Native fur hunters and traders settled here by the 1870s, with a trading station established in 1869 through 1882 and a post office in 1898, making it one of the oldest settlements on Cook Inlet. 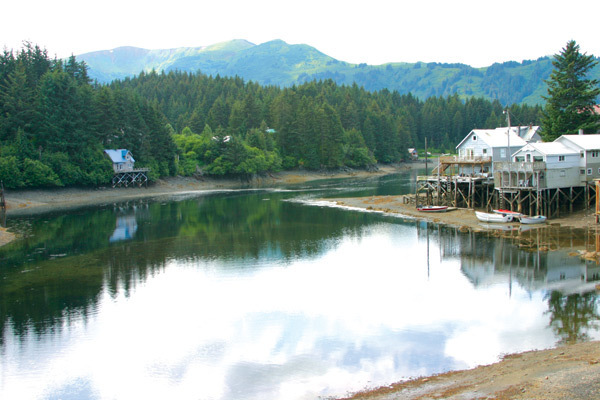 Many Russians left the area following the purchase of Alaska by the United States in 1867, but strong traces of their heritage still remain in Seldovia. Now a national historic site resting on a hill overlooking the city and bay, the St. Nicholas Russian Orthodox Church is Seldovia’s most impressive landmark. Built in 1891, it was the town’s social hub for many years. The bell tower was installed in 1906, and the whole church restored and consecrated in 1981. Recently the Orthodox crosses that adorn the pinnacles of the church have also been restored. On occasion a visiting Russian Orthodox priest will hold a special service in the church. There are also a Lutheran and a non-denominational church in town. After the 1964 earthquake, the landmass in Seldovia dropped approximately four feet. Houses and businesses along the waterfront, as well as the old Seldovia boardwalk dating from 1931, were flooded at high tide. During this time, the US Army Corps of Engineers was instrumental in rebuilding the area and Cap’s Hill in the middle of town was used to backfill the harbor front. Today, Seldovia’s harbor is lined with large boulders and is very secure. A section of the old boardwalk which was not damaged in 1964 still remains at the south end of town along the slough, perfect for a nostalgic, peaceful stroll. 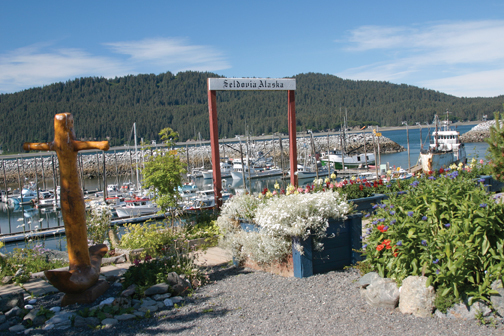 Seldovia is also known for its little pocket parks and gardens, strewn throughout the town and offering lovely sights and scents to enjoy while taking a rest on one of the many benches. Seldovia has an ice-free harbor in the winter, great for the fishing industry and transportation access. Over the years the processing of herring, crab and salmon have been important, with the first salmon cannery built in about 1910. Seldovia became one of the largest cities for the time in Alaska, with approximately 2,000 people, but the boom was short lived. With the building of a road from Anchorage to Homer and a decline in the commercial fishing industry, a gradual shift of population occurred. Top rated fishing guides are available for some of the best halibut fishing anywhere in the world, with weights exceeding 350 pounds. Halibut and rockfish are plentiful in Kachemak Bay in May to October and in Seldovia Bay until mid-September. Dolly Varden run from June to September. King salmon can be caught out of Seldovia by trolling throughout the year, but run beginning in July. Fish for red, silver and pink salmon in July and August. The Seldovia Slough has a great planted king salmon run and locals can be seen fishing from the bridge there in May and June. There is a fish cleaning station located near the boat ramp in the harbor. Besides great opportunities to fish on your own or with a charter service, flight seeing, and whale or wildlife tours are easily arranged in Seldovia. Favorite pursuits include clamming and beach combing, sea kayaking, strolling around the picturesque town and docks with the free Chamber Walking Map, biking or hiking the many wonderful local trails, and visiting the Seldovia Village Tribe Museum and Visitor Center. Located directly across the street from the small boat harbor on Main Street, the museum features Alaska Native culture, Seldovia history and local artifacts. A great diversity of bird species may be seen in Seldovia, along area hiking trails and at Jakolof Bay, while visitors arriving by boat will see a number of ocean-going birds. Visitors sometimes wonder about the broken seashells in the streets; these are courtesy of the “bombadier crows” who drop sea snails from above to crack them on the hard ground. Bald eagles are plentiful and live in the area year round. Seldovia and Kechemak Bays are ideal for kayaking. Kayak rentals are available from Kayak’Atak in Seldovia and may also be arranged with Mako’s Water Taxi in Homer. Sea cycling is an exciting way to experience the thrill of being on the ocean and seeing wildlife up close while learning about the history of Seldovia on small guided tours. State of the art pontoon pedal-powered “cadillac kayaks” float over the water, for peaceful fishing or exploring the waterways of Seldovia Harbor, Slough or Jakolof Bay. Contact Seldovia Sea Cycle Tours for more information. Popular hiking trails include the 1.2-mile Otterbahn Trail from town to Outside Beach, a beautiful spot with beachcombing, surf fishing, views of Kachemak Bay and the volcanoes Augustine, Iliamna and Redoubt. The trailhead is located behind the school. Check the tidal charts before you go, as access to Outside Beach is cut off at high tide. One source for Seldovia tide tables is through https://tidesandcurrents.noaa.gov/noaatidepredictions/NOAATidesFacade.jsp?Stationid=9455500. Starting in town as well, the moderately steep hike to the TV tower rewards with amazing views and ripe salmonberries and blueberries in late July to early August. The moderately easy Tutka Bay Trail leads to the salmon hatchery; trailhead signs are on Jakolof Bay Road approximately 13 miles from town. The challenging Rocky Ridge Trail begins on the road to the landfill site (Rocky Street) and offers spectacular scenery, although it is not recommended for small children. Jakolof Bay Road provides panoramic views of Kachemak Bay, McDonald’s Spit, Jakolof Bay and Kasitsna Bay. At Mile 7.5 of the road, steps lead down to McDonald’s Spit, a favorite spot for seabirds and marine life. Spend an afternoon exploring the beach, or continue out to Jakolof Bay, where the road offers many opportunities to get out to the water. Further out from Seldovia, Red Mountain and Graduation Peak trails can partially be mastered by children, while the entire routes take all day and are better suited to skilled hikers. The rewards in terms of geological features and scenery are well worth the effort. Bikers, hikers and visitors are reminded that permits are required for crossing Seldovia Native Association corporate land in the Seldovia, Red Mountain and Graduation Peak areas. Stop by the SNA office at 328 Main Street during business hours for permits. Seldovia’s nearly perfect environment for growing berries has led to the local production of a line of jams, jellies and syrups which make a great gift or memory of Alaska. The town provides a variety of visitor facilities, including a hotel, apartments rentals with kitchens, bed and breakfasts, grocery store, three year-round restaurants along the waterfront, bars and coffee shops, post office and gift stores. Open every day of the year, the Linwood was one of three original bars in town, catering to cannery workers, commercial fishermen and loggers before it was destroyed in the 1964 earthquake. Rebuilt in 1966, the building has undergone full renovation but remains an historic wooden structure in the heart of Seldovia. The Linwood Bar and Grill serves up local, import and organic wine, beer and liquor, and also caters to locals and visitors for a fun family-friendly experience. Enjoy fresh seafood, prime rib, burgers, pizza and pasta with everything made in-house, while taking in the incredible views on the waterfront deck and occasional live music. For tent campers and RV enthusiasts, there is a city campground with fire pits, water, restrooms and dump station. Take Anderson Way/Jakolof Bay Road for 1.5 miles out of town, then look for “Wilderness RV Park” sign on left-hand side of road. Pay at the City Office during office hours or at the Harbormaster’s Office weekends and evenings; maximum stay is 14 days. Most businesses have Internet access and there is 24-hour WiFi access from the library parking lot. 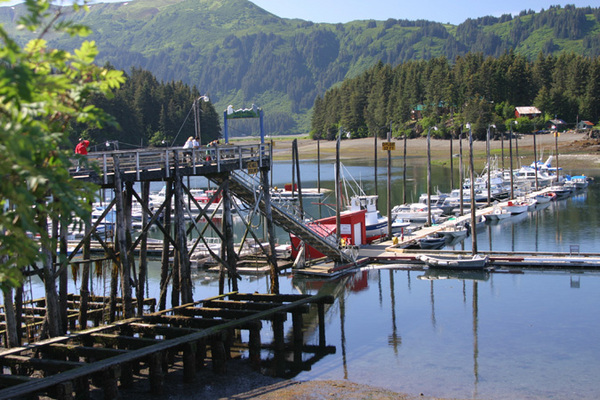 The Harbormaster’s Office, City Offices, the Library/Multi-purpose Building and Seldovia Village Tribe Visitor Center all offer public restrooms. Seldovia hosts exciting events like the Human Powered Fishing Derby over Memorial Day weekend, an event full of rowboats, kayaks (and fishermen who already know how to handle them) as well as music and a potlatch/fish fry. The Seldovia Summer Solstice Music Festival features a number of national recording artists as well as Alaskan musicians. The Seldovia Arts Council also offers concerts throughout the summer season. The grand day-long 4th of July Celebration has food booths, big parade, games and contests, rubber ducky race, canoe jousting, kayak races, the Salmon Shuffle 5 km race and baseball game. The annual Craft Invitational Chainsaw Carving Contest on Labor Day Weekend attracts carvers and spectators alike. 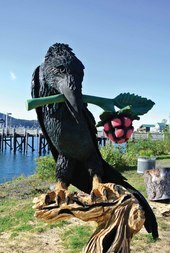 Take the “View the Carvings Walk” and locate the impressive local spruce chainsaw masterpieces donated to the Seldovia Chamber of Commerce positioned throughout the city for public enjoyment.